Dovish FOMC meeting outcome expected but is the Fed really done tightening? Dovish FOMC meeting outcome expected but is the Fed really done tightening? -- The markets are expecting a dovish outcome from today's FOMC meeting with the Fed stressing that its policy remains in neutral and possibly announcing that its balance sheet reduction program will end later this year. The markets are expecting Fed Chair Powell to reiterate his recent dovish tone in his press conference today. The FOMC at its last meeting on June 29-30 surprised the markets by dropping its guidance for higher rates and adopting a neutral policy. The markets believe that the Fed's rate-hike cycle is over and that the Fed's next move will be a rate cut. 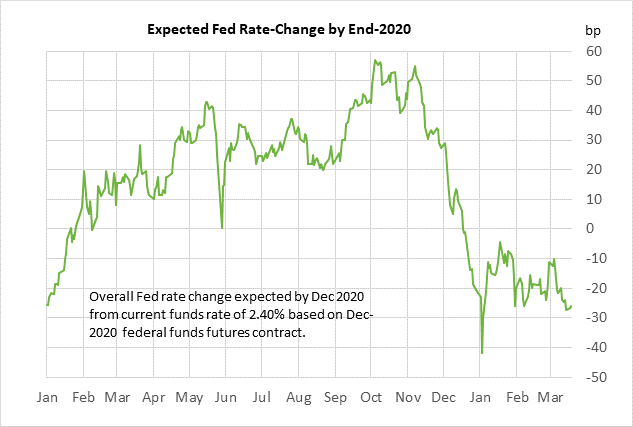 The market is discounting a 24% chance of a -25 bp rate cut by the end of this year, according to the Dec 2019 federal funds futures contract, which closed at a yield of 2.34% on Tuesday (i.e., 6 bp below the current IOER funds rate trading level of 2.40%). By the end of 2020, the market is discounting a 100% chance of that -25 bp rate cut. In our opinion, however, the jury is still out on whether the Fed's rate-hike cycle is over. We suspect that the Fed would like to sneak in one or two more rate hikes before calling this cycle a wrap. Today's updated set of Fed-dot forecasts for the funds rate should provide some guidance on whether FOMC members still would like to see another rate hike or two. 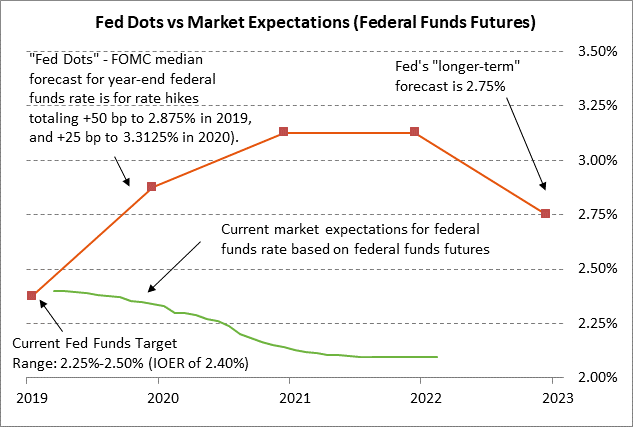 The median forecast in the last set of Fed-dots, released at December's meeting before the shift to a neutral policy at the January meeting, showed FOMC-member expectations for three more rate hikes, i.e., two in 2019 and one in 2020. A recent survey by Bloomberg found a consensus forecast by Wall Street economists for one more rate hike this year in September before the rate-hike cycle ends. We believe that the Fed would like to raise interest rates one or two more times, if and when the coast becomes clear, because the current funds rate level of 2.40% is still below the Fed's longer-run neutral funds rate estimate of 2.75%. We believe the FOMC would like to push the funds rate up to at least the 2.75% level, if not 3.00%, in order to get to a monetary policy that is neutral for the economy, i.e., that is neither stimulative nor restrictive. The reality is that the current federal funds rate level of 2.40% is still historically low relative to inflation. The current nominal federal funds rate of 2.40% translates to a real federal funds rate of (1) 45 bp when measured against the 10-year breakeven inflation expectations rate of 1.95%, (2) 40 bp measured against the Fed's inflation target of +2.0%, (3) 50 bp against the current PCE deflator of +1.9%, and (4) 30 bp against the current core CPI of 2.1%. That range of 30-50 bp for the current real federal funds rate, depending on its definition, is far below the long-term average of 175 bp seen since 1971. The current real funds rate of 30-50 bp is closer to, though still below, the average of 81 bp seen in the 2001-06 period before the Great Recession. 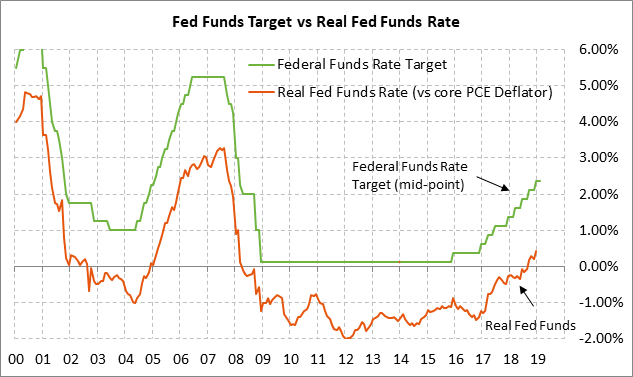 If the Fed were to raise the funds rate target by one more notch to 2.50%/2.75% with a new IOER rate of 2.65%, then the nominal funds rate would be just 10 bp below the Fed's estimate of a 2.75% neutral rate and the new real funds rate area of 55-75 bp would be close to the pre-Great Recession era of 81 bp. Regarding the balance sheet, the market consensus is that there is a good chance that the FOMC today will announce when it will halt its balance sheet reduction program, although announcements related to the balance sheet composition will be left for later. A recent Bloomberg survey found a consensus that the Fed will halt its balance sheet drawdown program later this year in Q4 with the balance sheet at about $3.5 trillion and the bank reserve component at about $1.2 trillion. 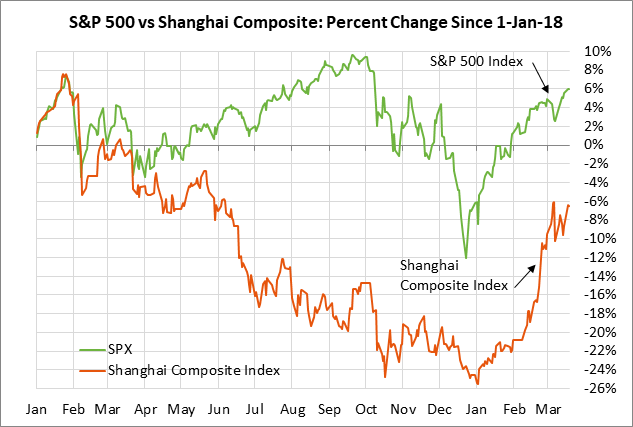 US/Chinese officials will exchange visits but talks reportedly slow as China pushes back -- Sentiment in the U.S. stock market cooled a bit on Tuesday after the Wall Street Journal reported that Chinese officials are pushing back on some of the issues in the trade talks. However, President Trump on Tuesday said again that the talks are going "very well," leading the markets to hope that the Chinese push-back is just a normal negotiating tactic as opposed to a prelude to a collapse in the talks. In any case, the WSJ also reported that USTR Lighthizer and Treasury Secretary Mnuchin will travel to China for trade talks in the week of March 25 and that Chinese Vice Premier Liu will visit Washington the following week. The article said that the target is for wrapping up the talks by late April. PM May now focused on wrangling a Brexit delay from the EU -- Brexit Secretary Barclay on Tuesday said that another vote on Prime Minister May's Brexit plan appears unlikely for this week due to Speaker Bercow's refusal to allow a second vote on a substantially similar Brexit bill. Ms. May seems to be hoping to get the bill changed by enough to allow another vote by next week, possibly by changing the Brexit deadline in the bill. The odds still do not appear favorable for passage. Ms. May is scheduled to attend the EU Summit on Thursday and Friday where EU leaders will consider extending the Brexit deadline, with the length of the extension depending on whether the UK Parliament approves the Brexit deal or not. 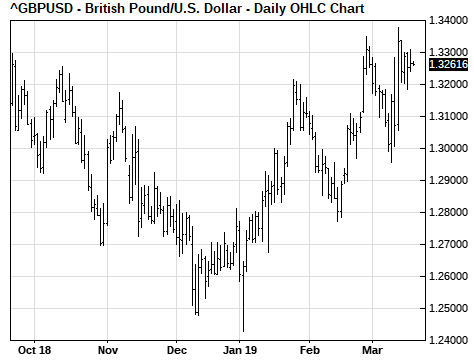 There is talk about a 9-12 month extension if Parliament does not approve a Brexit bill, allowing time for a Brexit rethink, possibly involving new elections or a second referendum. There is also talk that the EU might extend the deadline but demand that Ms. May decide by mid-April whether she can get a Brexit bill passed by July 1, which is the deadline for the UK to participate in the EU elections, or alternatively request a long extension with elections or a second referendum.